How Much Grain or Concentrates Will My Horse Need? How much grain or concentrate feed should you feed yorr horse? Most horses can eat grass and hay and stay healthy. But sometimes, a horse will need a little extra. The easiest way to provide more food energy and nutrition is through concentrates like grain or mixed feeds. How much concentrate or grain you feed your horse will depend on your goal. Do you want your horse to gain weight, it is carrying or nursing a foal? Or is your show or work horse working very hard and needing extra energy? The next step is to read the label on the feeds you have available to you. Often feed companies will have formulations for different types of horses such as seniors, broodmares or performance horses. The label has a lot of important information. It will probably tell you to feed a certain percentage per body weight. This percentage will guarantee that the horse is getting the recommended nutrition. However, depending on the horse’s condition or workload some people will adjust that amount. The proper way to measure concentrates is by weight. An old kitchen scale is handy for this. This can be time-consuming each time you feed, especially if you have several horses. So, you’ll probably use an old coffee can or other containers to scoop your feed. Weigh the feed in the scoop and note how much feed is in the container. Be sure to calculate the weight of the container so you won’t be short changing your horse. That way you won’t have to weigh the feed each time. Also, be aware that all feed does not weigh the same. Your coffee can of oats will be much lighter than a pelleted concentrate. There are no absolute standards for feeding a horse. Monitoring your horse’s condition and energy levels is the only way to tell if your horse needs more or less concentrates or hay. If your horse is too energetic, you’ll want to decrease the amount of energy producing feed. If your horse is losing weight or tires easily in work and is eating free choice quality hay or pasture you’ll need to increase the horse’s feed concentrates. Older horses and growing foals may benefit from extra grain. Be sure not to over-feed foals, however. They benefit from being on the lean side, rather than pleasantly plump, because rapid growth may cause joint problems. If your horse is quite fat, concentrates, except for a small amount of a ‘balancer’ that can make up for any shortfalls in the nutrition of the hay. won’t be necessary. To learn what type of balancer or supplements to feed, have your hay tested. Don’t just increase a horse’s feed without looking at other problems that may be causing weight loss. Dental problems, parasite load, cold weather and heat stress can cause weight loss. Just throwing food at these problems isn’t fair to the horse who may not be only hungry, but uncomfortable too. The bulk of your horse’s diet should be either hay or grass. This is what your horse’s digestive system was made to deal with. In the wild, only a very small amount of a horse’s food would contain grains—only what they would get while grass was going to seed. 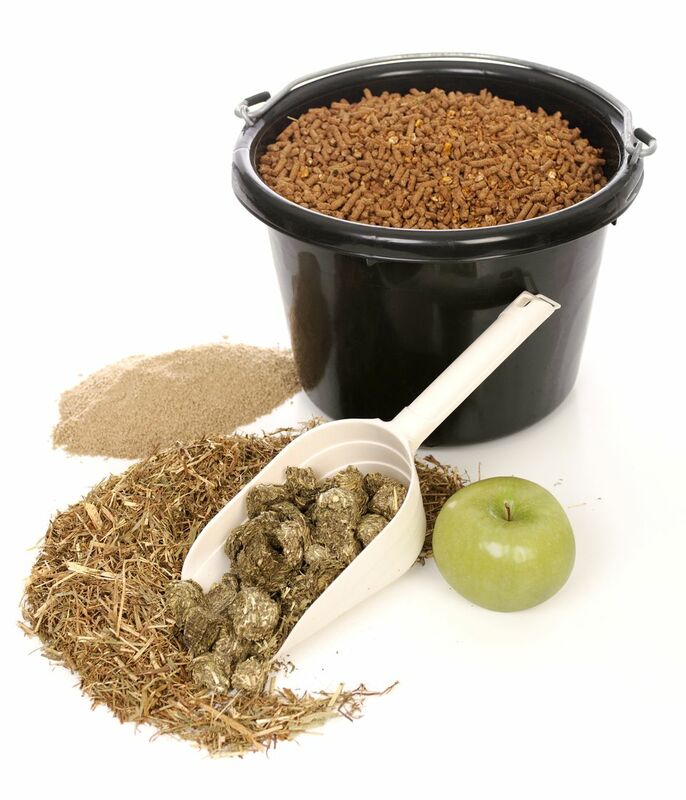 If you are going to add grain or concentrates to your horse’s diet you can replace up to 40% of its fodder with the concentrate. In some very special cases, such as a horse that is racing, horses are fed only 1% of their body weight in hay. But feeding high concentrate to fodder ratios can cause boredom (wood chewing, weaving, cribbing), colic, or other problems. So be sure your horse is getting lots of roughage in the form of hay or grass.